When we’re working with Business to Business companies, we think about site conversions differently. While the goal is to generate sales for the items our client manufactures, our B2B clients are selling to the seller of their goods, rather than the end user. As their agency, our job is to help them generate interest and measure the effectiveness of their marketing. One of the ways we do this is by using exit links. Our client’s site offers plenty of great information on the products they manufacture. Photos, dimensions, and other details are readily available, along with where these items can be purchased. Enter the exit link: the spot where the consumer leaves the manufacturer’s site to purchase the item from their preferred retailer or find a distributor who carries it. 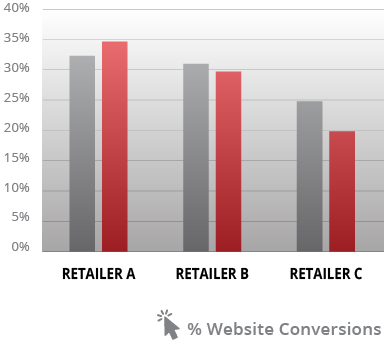 This graph identifies the sales volume found within each retailer, versus the percentage of times that site visitors on the manufacturer’s website clicked to each of these purchase locations. Retailers A, B, and C are no surprise. These are the largest, most well-known retailers for the industry. 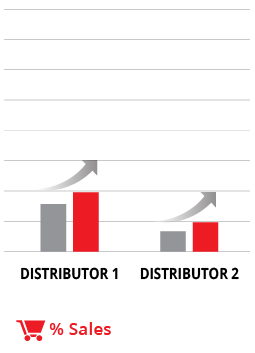 But the smaller distributors are outselling the pace of their exit link percentage. This might indicate an opportunity ripe for some strategic marketing in those areas, using co-op to generate a stronger partnership for the brand. Or, it might represent a consumer sentiment shift from big-box to small or independent retailer. Either way, this trend is something to watch, and should be used to confirm that the marketing activities are the right ones.